This will be the 3rd time in a year that I will author a post about football, and that’s about three more than I was planning to. But this latest Deflategate imbroglio is too delicious to pass up. Some of you may remember that at the end of July I posted, when the arbitration decision was initially released, that I thought that Tom Brady was guilty as charged with respect to having knowledge of or approving the deflation of footballs by locker room staff at the AFC Championship game. My belief was based on my experience as an investigator, and (1) my doubt that two junior locker room staff would have decided to deflate footballs on their own and (2) that it was more than just coincidence for Tom Brady to destroy his cell phone (or have one of his assistants do it for him) on the same day as he was scheduled to meet with Wells, when he knew full well that Wells wanted it for evidence. I still stand by those beliefs. Robert Kraft, who owns the team, also accepted the punishment of a $1 million fine and the loss of a first-rounder draft pick in 2016 and a fourth-rounder in 2017. That sure made it look like the Patriots were guilty of something. Kraft is a businessman. He knows how to negotiate. You think this guy is kicking himself now? On the other hand, it’s clear that the NFL made a mountain out of a molehill. And then totally screwed up the molehill. The arbitrator’s decision was beyond the scope of his or her authority. The arbitrator’s decision was manifestly unfair or involved a conflict of interest. The most important issue here is that Berman did not buy Goodell’s equating deflating footballs with the use of performance enhancing drugs, an analogy which, on its face, just seems ludicrous. When this issue of deflated footballs first came up, they should have slapped the Patriots with a yellow card warning* and a $25,000 fine and told them, boys, don’t do this anymore. Instead they tried to make a big example out of them. 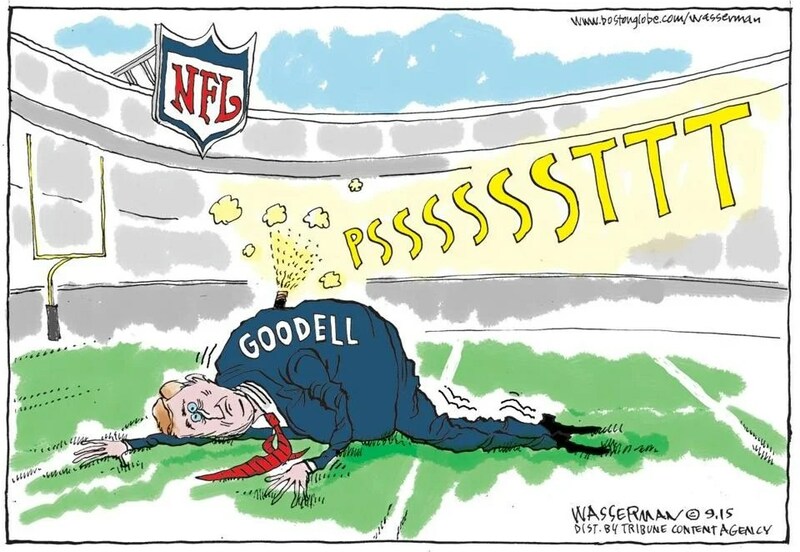 Because he found the NFL’s award to be procedurally deficient, the Judge didn’t even have to address the manifest unfairness of Goodell serving as the hearing officer on an appeal where his own team authored the “indepdendent” report. In any normal arbitration, the hearing officer is a neutral third party, not an advocate with a stake in the outcome. The problem with Goodell and his decision making is that the man has no character. His decisions are all over the map. Take the Ray Rice imbroglio: first he handed Rice a two game suspension for slugging his wife. At that point we already had the video of Rice dragging his unconscious wife out of the elevator by her feet. Then the video surfaced of Rice actually slugging her inside the elevator — which the Commissioner denied seeing even though it had been sent to him — at which point, bowing to the universal outrage, Goodell suspended Rice indefinitely. Which decision was justifiably overturned by a federal judge. Goodell than suspended Adrian Peterson indefinitely for his using a switch on his four year old son as a form of discipline. That incident resulted in a “no contest” plea by Peterson to the misdemeanor charge of reckless assault, and that indefinite suspension was also overturned by a federal judge. It’s clear that Goodell has a broken moral compass, that he has no idea what is serious and what isn’t serious, what is job related and what isn’t job related, and how to mete out discipline in any kind of consistent or fair manner. He may have been a cash cow for his league owners, but he’s also been a public relations nightmare. Like Tony Hayward, the embarrassing CEO of British Petroleum during the Deepwater Horizon spill disaster. Click on the Federal-Court-Decision-on-Deflategate to read Judge Berman’s ruling. *Yes, I know that a yellow card warning belongs to that other brand of football, what the rest of the world knows as “association football,” so it’s used here as an ironic metaphor. This entry was posted in Culture, Law and tagged deflategate. Bookmark the permalink.